Angela Chao, Deputy Chairman of the Foremost Group, recently joined her father, Dr. James S.C. Chao, Chairman of the Foremost Group, and her sister, former US Secretary of Labor, Elaine Chao, at Beijing University. On October 21, 2015 the family was honored by the university when it was introduced into the educational institution's Chinese Entrepreneurs Hall of Fame. The Chaos were received warmly by teachers, students, and other members of the audience, and special tribute was paid to Dr. James S.C. Chao, founder of international shipping company, Foremost Group. The night's opening remarks were made by The Honorable Secretary Elaine Chao, who shared with the audience her story of immigrating to the US when she was eight years old. 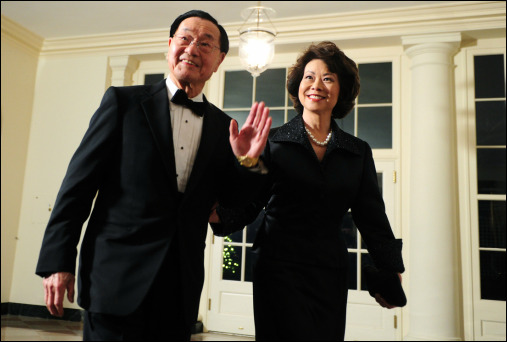 She was also the first of Chinese heritage and the first Asian American to hold the position of Labor Secretary. Secretary Chao spoke about her unique journey along a culturally-infused path, that gave her a heightened level of understanding and capacity to navigate through a complex world. She said that she owes her success to her mother and father, who stood with strength behind their children, confident in a bright future for their family. She said they gave to their children the keys for success: optimism, diligence, honesty and loyalty. Angela Chao told the audience that as a second-generation Chinese American, born in the US, she grew up in a family rooted in traditional Chinese culture and traditions. She said these formed the fabric of her life and that they are as relevant today as they were at the earlier stages of her life. Angela encouraged the audience to integrate the two cultures, while at the same time not losing the roots of their Chinese heritage. She said that while much progress has been made toward improving cross-cultural understanding, there is still a lot of work to do, and inspired the audience to take an active role in this process of building bridges between the two nations. Dr. James S.C. Chao rounded up the evening, sharing his legendary story of building an international shipping company from scratch, and the lifetime work he undertook with his wife to build bridges between East and West. He inspired everyone with his love story and partnership that still motivates him in all of work, especially philanthropy, today.